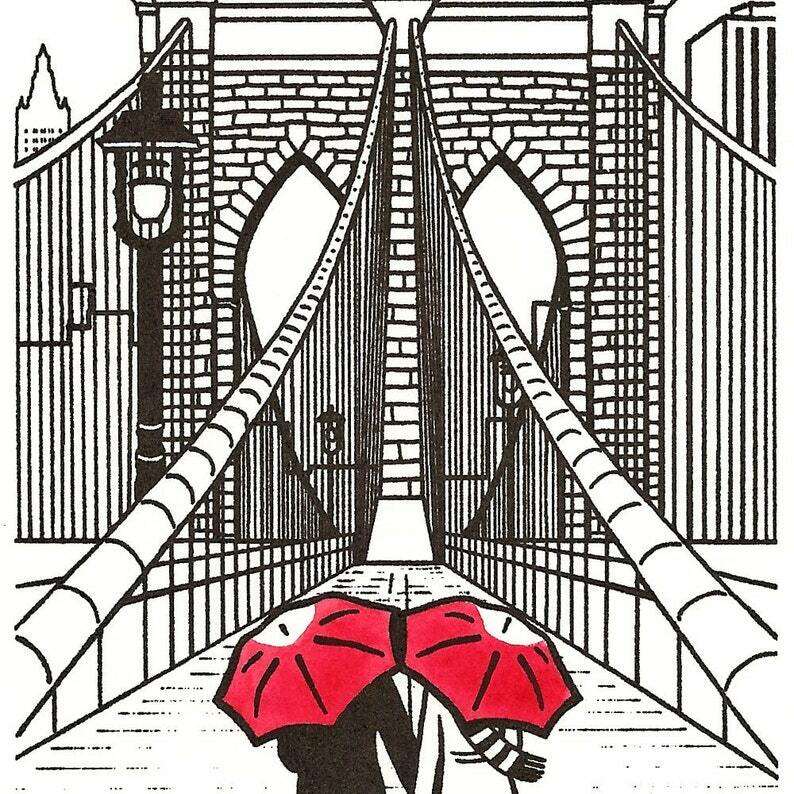 This original gocco screenprint shows a couple enjoying a walk over the Brooklyn Bridge on a winter day. It is one of my favorite things to do when visiting New York, especially since it's just long enough to work up an appetite for the pizza and/or ice cream waiting on the Brooklyn side! This print is part of a limited edition of 400. The black is hand printed from an original illustration, and the red umbrellas are painted with watercolor (please allow for some minor variations since each one is individually printed and painted). The image size is approximately 3.5 x 5.75 inches on white Stonehenge paper. The total paper size is approximately 9 x 6 inches. I know the paper size is unusual, but never fear, you don't need a custom framing job, an 8x10 inch frame with a standard white 5x7 mat looks great! I usually buy mine from Michael's craft stores, where they sell simple black frames with the mat already included (these are the frames my prints are pictured in). Ikea and Target also usually have good options too. Each print is signed and numbered. Edition number subject to availability.